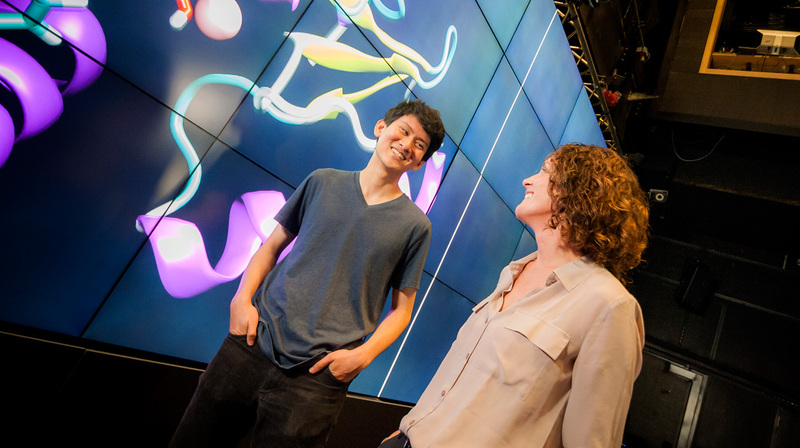 At just 16 years of age, Eric Chen began working in a UC San Diego biology laboratory on a more effective way of developing drugs to treat the flu virus. Now, his name and his study have gone viral. Chen, a senior at Canyon Crest Academy, has been awarded the grand prize in the Google Science Fair. His project, “The Taming of the Flu,” was chosen in the competition open to students ages 13 to 18 from 120 countries worldwide. 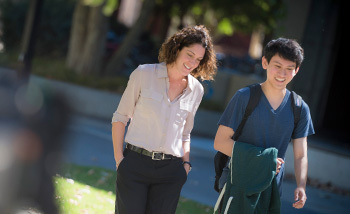 In May 2012, Chen took the initiative to contact Rommie Amaro, an assistant professor in chemistry and biochemistry at UC San Diego, who enthusiastically welcomed him to delve into the world of computational biology as an intern in her lab. Chen joined Amaro in her lab in Urey Hall on campus Monday for an interview with NBC Nightly News, one of several high-profile features spotlighting Chen’s path to becoming an emerging scientist. In the summer of 2012, Chen joined Amaro’s newly launched science outreach program called BioChemCoRe. The intensive research-focused program offers diverse middle and high school students from across the nation and around the world the chance to discover science. One of the goals of the eight-week summer program is to help advance STEM (Science, Technology, Engineering and Mathematics) education among youth; it is offered at no cost to participants as a result of grants secured from the National Biomedical Computation Resource (NBCR), National Institutes of Health (NIH) and the Hellman Foundation. BioChemCoRe presents students like Chen the opportunity to nurture their potential through experiential learning in a laboratory, professional development workshops and field trips to local destinations such as the Palomar Mountain Observatory. After completing foundational studies in biophysics and computer science in the BioChemCoRe program, Chen quickly branched out into his own research project. Influenced by the impact of the swine flu pandemic in 2009 (the first U.S. occurrence was discovered in San Diego), he began to investigate a means to speed up the drug discovery process that could protect against an even more deadly flu plague caused by more lethal variations of the virus. Using a computer to analyze more than half a million molecules, Chen identified a list of 237 potential new drug targets that could inhibit the virus from replicating. From here, he produced 3D models of each protein influenza endonuclease and biologically analyzed his findings to validate the results. Whereas most drug development requires millions of dollars and up to a decade to create, Chen said he believes virtual screening could be the key to a more effective way of promptly producing antiviral drugs. In addition to Amaro’s lab, Chen also collaborated with Gen-Sheng Feng, a professor of pathology at the UC San Diego School of Medicine, as well as with scientists at The Scripps Research Institute. Drawing on the power of the San Diego Super Computer Center at UC San Diego and gaining technical advice from professors and postdoctoral students provided Chen a unique opportunity to advance his work far beyond what most high school students dream to endeavor. “The supercomputer was vital tool in my project, allowing me to perform simulations and virtual screens requiring huge amounts of computational power,” Chen said. The Google Science Fair is an international competition open to individual students and teams within three age groups. Named a finalist in the 17- to 18-year-old age group, Chen presented his research during three rounds judged by panels comprised of teachers, university professors, science luminaries and tech innovators. On Sept. 26, he was named both the winner of his age group and the grand prize winner of the entire competition during the award reception at the Google headquarters in Mountain View, Calif.
As the grand prize winner, Chen was awarded a 10-day trip to the Galapagos Islands aboard a National Geographic vessel, where he will have the chance to experience up-close encounters with giant tortoises, kayak through hidden coves and snorkel with exotic fish. He also received a $50,000 scholarship; an individualized experience at CERN (European Organization for Nuclear Research), the world’s largest particle physics laboratory; a $10,000 grant and a year’s access to Scientific America for his high school. “I want to be a role model for other young aspiring students, and Google is a great platform to do that,” said Chen, who makes time to tutor local middle and high school students in science. 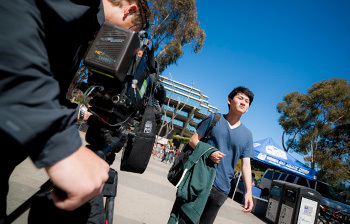 Immediately following the award, Chen was flooded with interview requests, including a feature for NBC Nightly News, which was filmed over a two-day period on the UC San Diego campus, at Chen’s home and Canyon Crest Academy. 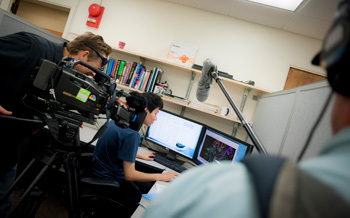 On Monday, a crew of four arrived at Urey Hall to capture Chen in Amaro’s computer lab analyzing the structure of a protein. Cameras followed him across campus and down Library Walk, making a stop at the Qualcomm Institute’s Vroom (Virtual Room) and ending with a demonstration at the Feng laboratory in the UC San Diego School of Medicine. Just beginning his senior year of high school, Chen’s classes this year are dominated by the arts and humanities as a result of already exhausting all of his high school’s science offerings. His next step will be to begin applying to universities next month—including UC San Diego—as well as continuing to develop his research, which is already patented and garnering interest from pharmaceutical companies. As for career aspirations, Chen is torn between becoming a university professor or an entrepreneur. Either way, he is confident about his dream of making a positive impact on the world at large.